WE MEASURE OUR SUCCESS NOT BY THE NUMBER OF CLIENTS WE HAVE, BUT BY HOW WELL WE SERVE THEM. 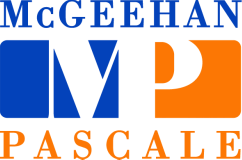 ​McGeehan Pascale, PLC is a boutique business law firm located in the Washington, D.C. metropolitan area (Fairfax, Virginia) with more than a quarter century of experience representing businesses. Our focus is representing and counseling start-ups to mid-size businesses from various industries and market spaces. McGeehan Pascale, PLC provides exceptional value to both growing businesses and those enjoying an established market share. No matter the size or industry, McGeehan Pascale, PLC provides legal solutions that serve our business clients' best interests when it counts the most. McGeehan Pascale, PLC is the small and mid-size business alternative to in-house counsel. We offer business advice and experience that would be expected from in house counsel and much more. We believe in a holistic approach to solving the challenges facing businesses. A great business counselor must be effective in the board room and experienced in the courtroom. At the intersection of a transactional and litigation practice is where McGeehan Pascale, PLC has developed its competencies and in turn provides exceptional value to its business clients. John McGeehan, managing partner, has advised businesses for over 35 years and has received several awards both personally and as a business owner. McGeehan has also been awarded Martindale-Hubbell's highest rating in both ethics and legal skills, with a special recognition in the field of commercial law. These rankings represent the esteem of professional colleagues and the judiciary. Additionally, John was recently honored with the Service Corps of Retired Executives’ (SCORE) Washington, D.C. Chapter’s 2017 Distinguished Service Award. This award is given in recognition of his dedicated and voluntary service to SCORE and the small business community. SCORE is the premiere source of advice and programs for entrepreneurs and small businesses throughout the United States and a resource partner with the U.S. Small Business Administration. McGeehan Pascale, PLC is proud of its 16-year association with SCORE and service to entrepreneurs and small businesses in all business needs. Whether you are a start-up in a garage or an international business, we encourage you to join the many others that trust and value our counsel.